Most bicycles come equipped with gears to help riders tackle various terrains. Common gearing on bikes include 10, 18 and 21 speeds. The number of gears a bike has is figured by multiplying the number of front chainrings by the number of gears in the rear cassette. For example, a 21-speed bike has a triple chainring in the front and seven rear cassette gears. Once you learn to master the gearing of a 21-speed bike, you'll be able to enjoy longer rides that leave you less tired. The front chainring of your bike features three rings and is controlled by your left handlebar shifter. The chain should be on largest, "big ring" during flats and descents, on the medium ring when riding into headwinds or on moderate climbs and on the smallest ring during tough ascents. The rear cassette features seven gears, controlled by your right handlebar shifter. The smallest rear gear is the hardest and the largest is the easiest. 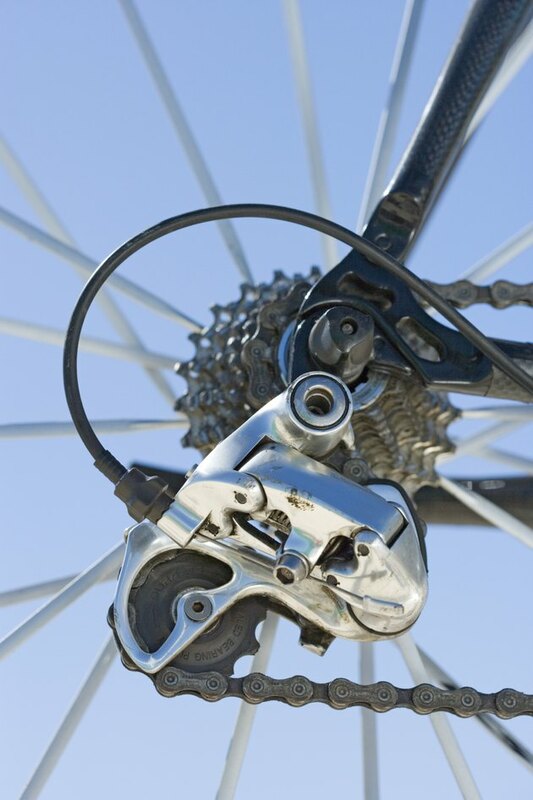 Always pedal continuously as you shift -- failure to do so can cause the chain to jump gears or fall off. The front chainring should be shifted first for the biggest adjustments and the rear gear should be a secondary shift to help fine-tune resistance. Avoid riding with the chain simultaneously on the biggest chain ring and the biggest rear gear, and vice versa. Doing so can cause unnecessary chain stretch and derailleur wear, not to mention create an annoying, grinding sound. There are two common mistakes that cyclists on geared bikes often make. First, they don't anticipate gear changes ahead of time. When you see a hill approaching and know in advance that you'll need to shift into an easier gear, do it before you actually begin the climb. Trying to shift gears midclimb is tough on the drivetrain and can be tricky to do. The second mistake is not shifting into an easier gear when approaching a stop. If you're cruising on a flat or have a tailwind pushing you along, you may be riding in one of your hardest gears. That's great, until you come to a stop and attempt to get going again in that same gear. Make regaining momentum much easier by shifting down a few gears as you approach stops. The purpose of different gears is to help riders hold a steady cadence regardless of terrain, wind and leg fatigue. Maintaining a quick, continuous cadence of 80 to 90 rpm can noticeably increase endurance and stamina. To make your gears work for you, shift into an easier gear as you approach a climb or begin to fatigue. If your cadence starts to drop for any reason, take this a signal to switch to an easier gear. On the other hand, capitalize on flats, descents and tailwinds by shifting into harder gears. This will allow you to increase your speed while maintaining the same cadence and exertion level.